When I first began my public life as the Anti-Democracy Activist, I assumed that I’d be more or less the only person on the Reactionary/Neo-Reactionary/Traditionalist/New Right who was a fan of anime. Now I’d say that from what I’ve seen, there are two kinds of western anime fans: squishy liberals, and serious rightists. Why this is the case, I couldn’t say, but that’s what my experience (especially via my interactions on Twitter) has shown. Which brings me to the above picture. The merch you see is all related to a popular recent series called Tiger & Bunny, which is a superhero show – a kind of mashup of ideas from western superhero stories like The Avengers, Heroes, and X-Men (this latter, in retrospect, should have been my first warning). I was rather a fan of it myself, until just recently. That’s when I made the innocent decision to watch the latest part of the story, a movie based on the series. Imagine my surprise when I found that the creative team had made the decision to take time out of their superhero story to deliver a strong dose of homosexualist propaganda of the sort which seems to be ubiquitous, universal, and inescapable in virtually any entertainment form today. And they did it in anime – the one place I thought I was reasonably safe from it. 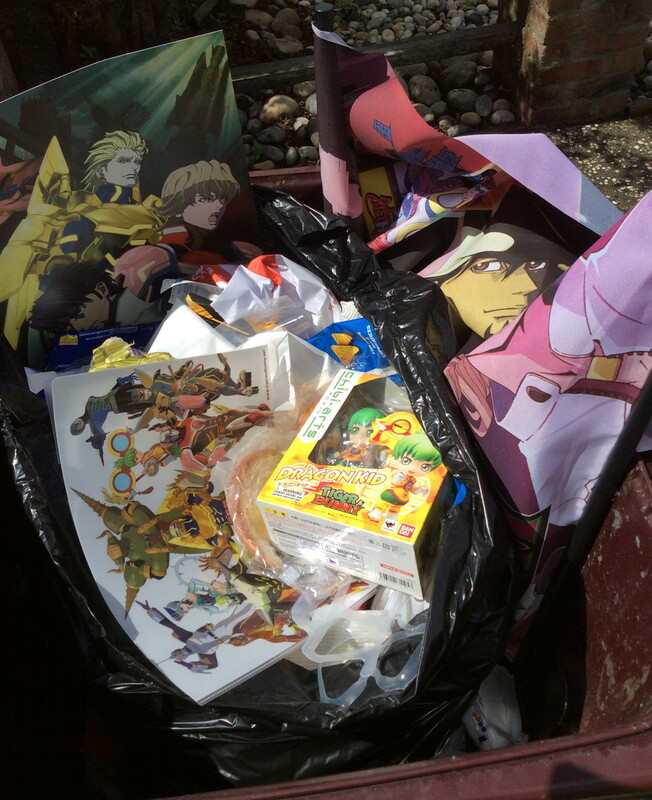 And so I made a sweep of my living quarters, rounded up every bit of Tiger & Bunny merchandise I had – it was not a lot, but there was some at least – and I threw it all directly into the garbage. I do not have any great amount of political power – fortunate, for those who do their part to tear down everything in which I believe – but I have at least this tiny bit of recourse: To you who made this movie, for your decision to insert yourselves into the Culture Wars on the side of the normalization of degeneracy, decay, and fanatical egalitarianism, you have lost a fan. Which is nothing, right? You can get along without me just fine. But there’s one more thing: I don’t plan to be quiet about it, nor even to limit it to you. So let me now address my readers. I cannot believe that I am the only one who something like this has happened to. I’ll bet that all of you have some sort of goods related to an entertainer who has produced material, or a corporation that has funded causes or created commercials, that advocate things that go against everything you believe in. You have a CD, a t-shirt, a poster, a cereal box – something that’s got their name on it – that you bought at some point in time before either they declared war on your beliefs, or you came to understand that they had done that. So what do you do when a corporation or an entertainer takes it upon themselves to trash everything you stand for? Trash them right back. Take their grubby merch and throw it right in the trash. Then do what I have done – take a picture of the stuff you’re throwing out, sitting right there in your trash bin, and put it in front of as many eyes as you can. Why do corporations and entertainment companies bend to the will of the left but not of the right? There are many reasons, but one of the most important ones is that they think it’s the safe thing to do. That’s because the left tends to complain loudly, whereas the right rarely does. And whose fault is it that this is the case? If you are on the right, it is yours. Unless you decide to do something about it. As for me, this is my own humble, almost-certainly meaningless start. They trashed my beliefs, so I trashed their merch, and I’m telling anyone who will listen about it. Others may do the same, or perhaps they will not. But at very least, I now feel the way that I always do when I get rid of dirty trash.